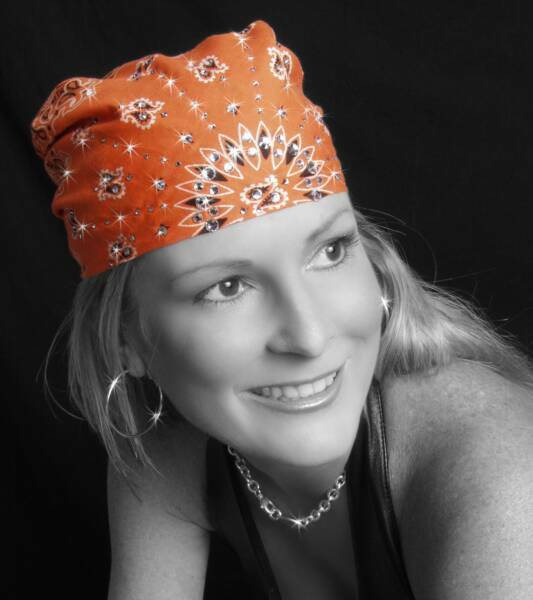 Among a wide variety of hats one of the most stylish, simple and versatile is a simple bandana. To tie it in various ways, and different textures and colors of fabrics can make this hat suitable for parties, and for sports campaign. Do not have to wear a bandanna on your head you can tie it on the neck, on hand and even on the belt, permitting the size of a handkerchief. The easiest way to tie a bandana on the head in a standard way. To do this, take a square scarf and fold it diagonally. Then the resulting triangle cover your head and hold the Foundation on your forehead, tie the two side corners of the triangle at the back, align the tip of the triangle under the knot. Order bandana fit better on the head, the base of the triangle fold the small strip up before you tie the knot. In addition to this method of tying bandannas, there are others. For example, if you want to tie a bandana from a tough fabric, or a bandanna rectangular shape, put the scarf on the head, not folding it. One side of the bandana hold on his forehead, and the next it will all tie together at the back so that the remaining free ends turned under the node. Be sure to tie the knot tight and tight, placing it on his head, to the neck and not below the belt did not slip from the head. Pick the method of tying bandanas that will perfectly suit you and which will be in harmony with the type of fabric and style of your bandanas. In addition, you can tie the bandana not only on the head but on other parts of the body – for example, tying the bandana at the hip, you diversify your appearance and will make standard jeans original and neformalna. In the cold season warm and tight bandana tied around the neck will make your look more unusual and will protect you from the cold. Also as a neckerchief secular party you can use a silk bandana – it looks festive and elegant. If you like wristlets – tie a bandana around your wrist or forearm. Bandanas made of thin and light fabric can be used as a belt for a skirt or pants, and in hot weather - as a pareo. That's just not all who I love bandanas, they know how to tie them correctly. It would seem, is it difficult? Here is a simple algorithm correct tying bandanas: 1. Square bandanna folded in half to make a triangle. 2. Folded triangular bandanna laid on the head of the base to the forehead. The ends of the bandana (the vertices of the triangle) is then tied to the back of his head. But if someone doesn't know, say – a bandana is a square piece of colored fabric is quite large in size. Wear a bandana in different parts of the body: bandana tied around the neck, on the arms, legs and even hips. Often, of course, a bandanna worn on the head. How to tie a bandana that she kept a tighter hold. Below the belt was kept tight, the base of the hand applied to the head, additionally fold again the strip of 1.5-2 cm.